I wrote the following article for work after finding a particularly useful function for code review as first talked about in this article. 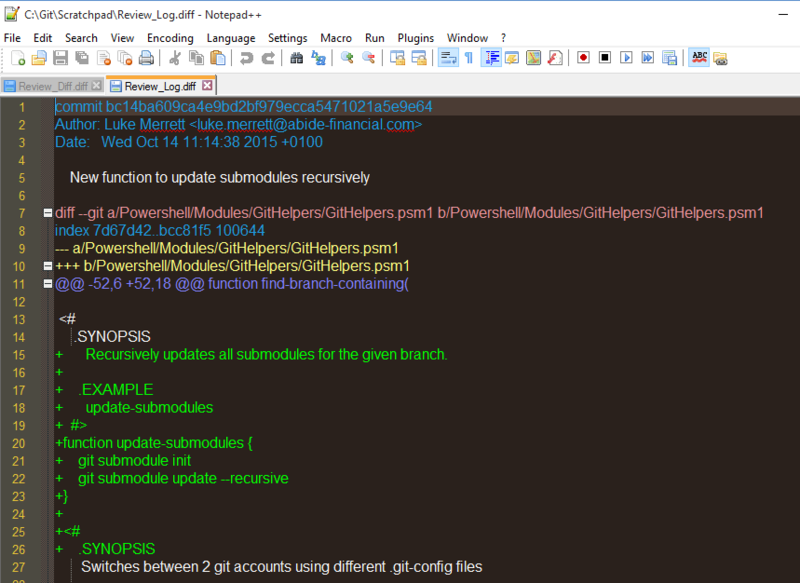 Powershell profiles are scripts loaded whenever you open Powershell under a particular user. They can be used to create helper functions, alias programs etc. If you use PoshGit you’ll already have a local Powershell Profile and can skip this step as it creates a profile for you. Anything added to that PS1 script will now be run when you open Powershell as your current user. Invoke-Expression "git log $OriginalBranch..head --name-status --reverse > Review_Summary.diff"
Invoke-Expression "git log $OriginalBranch..head -p --reverse > Review_Log.diff"
Invoke-Expression "git diff $OriginalBranch..head -p --reverse > Review_Diff.diff"
As with pretty much anything in Powershell you need to Set-ExecutionPolicy. If you want to see more advanced examples of usage; run “Get-Help code-review” and “Get-Help code-review -examples”.